Quartering elk in the field doesn't take that much time, especially if it makes the haul out quicker and easier. There is no need to haul the heavy inedible parts of an elk. Once you take pictures, you've got the image of the animal preserved for sharing with friends and family. There is a video of the gutless quartering method below. Before quartering, if feasible, point all legs downhill (if on the ground). 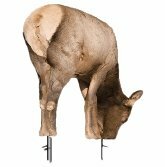 Once the front shoulder is skinned, lift the leg up and away from the elk. Start cutting the connective tissue beneath the leg. Keep pulling it back toward the spine while cutting the tissue. You will eventually see a large, round cartilage at the shoulder. Cut wide around that arc of cartilage. The front leg will come free with a few cuts through some thin muscle on top. 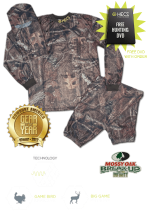 You can hang it in a game bag or put it down on a plastic table cloth on the ground. On the back leg, notice where the back leg pivots when the leg is moved around. The ball and socket joint is what creates that pivot point. From the pelvis cut toward the joint until you reach the joint with your knife. 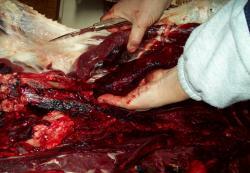 When quartering elk, there is more meat to remove besides the quarters. Cut away as much meat from the neck as you can from that side. (Good for chili and stew.) Cut down along the top of the spine. You will find a nice long strip of meat there that goes all the way down the spine on each side (back strap). 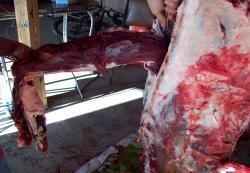 Separate the meat from the spine as you move all the way down from shoulder to the elk’s “waist” area. Cut off anything remaining that looks edible above the ribs and neck area. Bag and set these smaller pieces aside in a clean place. The fillets are the tenderest piece of meat on deer and elk. They are up under the spine, on each side, behind the last rib. You might have to cut the ends to pull them free, but since they are nice and tender, they are easily pulled out by hand. In the hustle of quartering elk, they can easily be forgotten. You can cut the meat off from between the ribs. There’s not a lot of meat there and they don’t taste like good, fatty beef ribs. We don’t care for the strong taste, but some people eat the liver. I’ve also seen people who went to the trouble to cut the tongue out and take that home. I don’t like the idea of having to “peel” the “skin” off the tongue to prepare it. Flip the carcass over and repeat on the other side. You’re now ready to cut the meat off the leg bones, or haul it out as is. Some people sprinkle pepper on the outside of the meat to keep flies off. We don’t, unless there are a lot of flies. Good quality game bags keep them off the meat anyway. At this point, the big quartering elk job is done and it is ready to be hauled out or deboned first. (click here for the deboning page). I don’t carry bones on my back. If I’m going to pack it out, I’m not carrying bones! It doesn’t take that much longer to bone out your meat. If you have a cart or sled, you can easily haul out the bagged meat and quarters on the bone. Return to Elk Down page, from Quartering Elk page.